Amish housewives have quite the workload. They do get some help in managing the household, though. Amish homes often feature modified appliances, built to run on power sources other than public electricity. Depending on what is allowed in a given church, you might see an air-powered mixer, or gas-powered refrigerator. Wringer-style washing machines are common. The most conservative Amish groups use only minimal technology though. The plainest Amish lack indoor plumbing and typically use ice for cooling food. And sometimes you have a mix of technologies. When I’m staying at one Amish friend’s place in PA, I grind the coffee beans by hand. But when one of the little boys came down with the croup, an electric-powered vaporizer purchased at Wal-Mart brought him relief through the night. 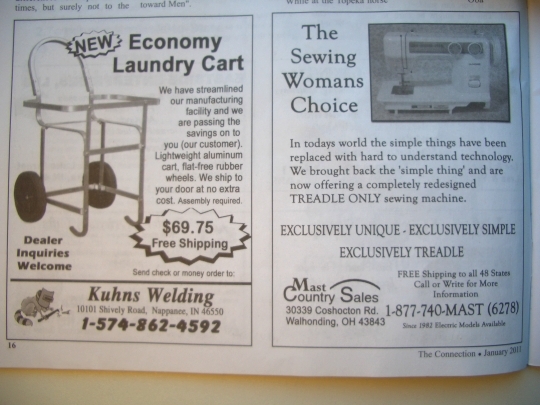 The photos on this page are from advertisements found in The Connection, a new Amish monthly magazine. Many of the ads feature “Amish-friendly” devices that help lighten the burden of household work. You can see a few more at the link. Other the past few years I’ve run a few experiments in simple(r) living, some intentional, others inadvertent (perhaps having been subsconsciously inspired by these heroic Amish housewives). When I first moved into my home, I did not have a refrigerator. But it was winter, so the ample windowsill allowed me to keep a few food items quite cool, at least until about late March/April. I didn’t and still don’t have a microwave. Ditto for toaster, electric can opener, blender. No TV either. My cell phone is ancient, and I find I don’t really care, as long as it keeps making calls. Lately, I’ve been washing all my clothes by hand and hanging them up to dry, since my combo washer-dryer broke down (repair guy says the part is due in tomorrow. This is one of the “inadvertent” tests). With a stove, I’ve never really missed having a microwave, even though growing up I thought it was an essential item. I find my head is clearer with no TV, though of course I do have the internet and a laptop, as well as a few other gadgets, like a basic iPod, and a Kindle for books. I’ve found the washer/dryer is the hardest one to give up, though. There is simply a lot of labor that goes into hand washing clothing. It’s hardly an “Amish” lifestyle, but I’m happy enough with it. Of course, if I had an Amish-sized family, I might find things tougher. But it’s interesting to take a moment to think about our non-essentials. If you had to axe some technology from your life, what would be first to go? Probably the teevee would be the first thing chucked. I hardly watch it anymore as it is…I had cable until last fall, when I realized that the only channel I did watch when I watched tv was PBS, and you can get that free on antenna. Any other shows…well if I really want to watch something most of the time if you wait a week the full episode shows up on the channel’s website. But I don’t really find much of interest on even then. I find myself using the microwave less too. Food just doesn’t taste as good cooked in the microwave as compared to the oven. For stuff I couldn’t give up…no one could take away my Kitchenaid mixer or my bread machine! I’d have to add the iPod as well since it helps keep me from getting bored when I work out. TV went many years ago for me. Don’t miss it, never did. Unfortunately Frank has TV but I am not inclined to watch it. Life is too busy to be parked in front of that thing all day. I washed clothes out by hand for many years out of necessity. It would be very hard now with the fibromyalgia getting so bad but I would do it if I had to. I used to throw “a load” in the bathtub, detergent and water and stomp on them like someone might do grapes the old fashioned way of making juice or wine. My feet were a better agitator than what you find in most washing machines, LOL. I do have a microwave, it was given me as a gift but I hardly use it and could get rid of it very easily. Actually as I sit here looking around my house, (rented) the only thing that I think I would not want to do without right now is my vacuum, but only because the house is carpeted. Were it my house and I had hardwood floors that too could easily go. Good article Erik and good question!! The answers should be interesting, LOL. Thanks Alice, Lindsay, enjoyed your answers. The tube has sort of migrated onto the computer in some ways. I still don’t watch much if any of it though, and only see minimal movies. On the microwave Lindsay, I think you’re right about food taste. Or maybe because it usually heats unevenly. I don’t use the microwave, but it is built in. It doesn’t taste different though, if you’re heating something up or want something steamed. But then I never COOKED in it. We got rid of cable but still have TV. We use the internet if we want to watch anything (streamed on the TV). Bread machine? Bought one, never used it. Takes just as long as to make bread the regular way, but tastes like complete and utter crap. Yuck! Don’t have a cell phone. Don’t have an MP3 player. Could live without the toaster, I suppose. Give me a good book of my own choosing, and I’ll curl up very content to while away “T.V.” time just reading! Amish housewives do have a helper, its a human one called their husband. Now what would i give-up, id say the first to go would be the cell phone and that would go for everyone especially if you take it to a movie or restaurant. I’m not a big TV watcher really, but every now and then i need to take a trip to Holly weird and watch something to relax.Im not even thinking of losing the car because i need that very much, I’m not sure why but it makes me smile. Well that’s it for me, and so in the end I’m really not giving up anything . Sorry folks. Richard from the Amish settlement of Lebanon county. It wouldn’t hurt if we all had less technology. Television is not a necessity. Nor are computers, cell phones, dryers. I hang my clothes anyway,rarely watch the television. If I didn’t have a car , would definitely want a horse and buggy. I love horses. It give them a job. (The horses) Would not want to give up my refrigerator or indoor plumbing . I also don’t use a lot of modern conveniences in my kitchen,not because I can’t afford it. They seem to just take up room and make people lazy. I admire the Amish and their lifestyle,but I couldn’t get used to eating all that meat and dairy . I think it is very bad for you. The TV would be first. I have two now and we have said that we should get a flatscreen one once one of them breaks. I have a secret plan of trying to convince my partner to not buy another one and then hopefully we will have less opportunity to watch it. Now you can watch almost anything online anyway so who needs a TV? I would also be able to give up most electrical appliances but the electric kettle is great and I would not like to not have a washing machine. In Sweden drying your clothes outside is not very strange at all, my mother did not have a dryer. She dried our clothes in the basement in winter and outside spring-autumn. The electric stove is practical when living in an apartment like I do but I would like to have a wood stove if I get a house someday. The computer and the cell phone would be the hardest to give up to me. A washing machine, an electric kettle, a refrigerator and a freezer are all great things. I would not choose to be without them but I could probably make it. I would make it with very little modern things but I don’t have any wish to give them up totally. I’d dump the TV first and the last thing to go would have to be the A./C! We only use the microwave to reheat or speed up thawing. The second paragraph in Dena’s post took the words right out of my mouth. TV is insidious; it will lure you in if you are not vigilant about keeping it out. We went for about 15 to 20 years, hardly watching much more than the Weather Channel and maybe a quick update on one of the cable news channels. Since the business I am in is so impacted by weather events the company I use to work for and the one I work for now have both installed cable TV in the operations control room where I work. Usually it is on the Weather Channel, a cable news channel or a business channel … but with the volume turned dowm. We turn the volume up on speakers that are on each individuals desk as needed. Slowly, I have found that I have started turning the volume up more often. Slowly I have allowed it to creep back into our home as well, but almost exclusively on the same channels or The History Channel, Nat Geo etc. Once again, thanks for the prompt Erik. Where is the remote so I can turn that darn time waster off? Erik, I want to let you know how much I enjoy starting each day with a post from AA. It’s great to hear from other people who are inspired by the Amish to cut back. I have never owned a tv, which seems like a tool of propaganda and consumerism. I grew up without a microwave or dishwasher, and don’t want them now. When we tore out our leaky shower we started using an old, claw foot tub for once a week baths, and doing wash cloth baths and hair washing in the sink as needed. It’s been two years now! Last winter we decided to stop pouring money into maintenance and fuel for our oil furnace, and we saved about $2400 by using only our wood stove. It was nice to have a toasty warm gathering place for the whole family, and we didn’t mind having icy cold bedrooms. When our lawn tractor broke last spring, we learned how to use a scythe. Now we get great exercise and are starting to produce our own hay on our three acres for our goats, lambs, and chickens. Our washing machine just broke, and if my husband can’t fix it, I’m prepared to do without, although with two young children, I need a good set up and a wringer for this to work. Future plans include a hand pump for emergency access to our well, since we need a way to water the animals during a power outage, and a wood cook stove, so that we can heat and cook more efficiently in the winter time. Hands to work, hearts to God:) We have found that more physical labor equals greater personal reward. Naomi, thank you, your comment made my afternoon (had a tough start to the day here…) I liked your ideas and especially the last line–“more physical labor equals greater personal reward”. I am definitely not as physically active as I once was and that hit home. Oldkat, you too…not to get too destructive here but I think the solution might involve a 12-gauge, the offending device in question, and the back of the barn 😉 That is the drastic approach I guess. I know how hard it can be to not turn it on though, once it’s there. 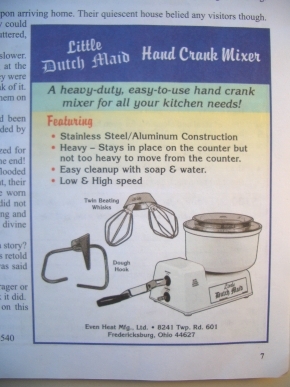 I am definitely looking into the Little Dutch Maid handcranked mixer and the new design treadle machine. We have electricity and I have a washer/dryer, but I used to do laundry by hand, and will go back to it soon. I had to stop immersing my hands in hot soapy water for a few weeks for health reasons. We hope to be offgrid again. No tv here, although we have internet and a laptop but limited bandwidth (via satellite)prevents us from watching online broadcasts. The hardest thing for me to give up is the water pump! I have lived without refrigeration even in summer – things were put in a weighted cooler in the spring. Air conditioning - yeah or neah? Thought-provocative post, Erik. As we speak, I’m missing my window-unit air conditioner. I’m trying to opt without it this summer. I recently asked Edna at the local Amish Country Store, how she “beats the heat”. “You really don’t, it’s just something we have to do”, she replied. They don’t have fans either. Oh my. The humidity is the hardest for me to deal with. I have two fans running now and am foggy-minded as I type with 65% humidity. I don’t have a TV either. Haven’t for years. Too much noise and not much worthy of tuning into these days. I only use my micro for warming coffee in morning and making soup in the evening. I’d rather wash dishes by hand than have a dishwasher. Like Alice, I would miss my vacuum. Does anyone else fair without an air conditioner? Wendy – I didn’t have an A/C until last summer and my husband insisted we get one. I find the summers in Chicago to be much milder than where I grew up in Nebraska…also I live only a few blocks from Lake Michigan and it seemed to keep the weather a good 5 degrees cooler than further inland. I could usually count on one hand the number of days where I though to myself “boy an A/C would be really nice” but those days I usually tried to find alternative ways to beat the heat…go to the beach, sit in a cafe and drink ice coffee etc. My husband is from Scotland on the North Sea so the summers there are very mild (their usual hottest day of the year peaked at around 75 most years). He struggles a lot with the heat, and since he works from home part time we finally caved on the A/C. Personally, if it was just me living alone I feel I could probably do without it though. Richard…I couldn’t agree more LOL! If my husband ever went back to working full time outside the home I’m afraid the house would be a complete wreck! Ann – what kind of bread machine do you have? I never could get a loaf of bread to come out beautifully…it would taste good, but it didn’t rise as high as I would have liked. I’ve always had probs with my oven temp fluctuating a lot so I’m leaning towards that being the reason I could never get my bread to turn out “looking” beautiful. Elin – I’ve noticed in Europe that few people have dryers in the house. My inlaws also couldn’t believe I didn’t have an electric kettle…that was one of their wedding presents to my husband and I! Lindsay–I will chime in as I am a part-or-majority-time resident of Europe (Poland)–I think you are right, not so many dryers here. I think it comes down to both space and power issues. I had to have one though, and with such a small place I went with the washer-dryer in one combo. It’s definitely not as good as what we are used to in the US, but better than having clothes hanging up all over the place drying. Magdalena, you are a few steps ahead of me here, I think 😉 Did you know about the Dutch Maid mixer already? I’m betting you did, but I’d be happy to think I might have gotten them one more customer! Keith, looking at your site amishworkshops.com, I am not surprised you work in computers. It looks great. I have some design changes I’m working on here as this is basically a pretty bare-bones blog design-wise, but am rolling them out slowly (on that note, the logo is coming back soon 🙂 ). My challenge is I am not trained at all, but it is fun to learn as you go. It is a delight to know that others are out there like me. We live in the middle of crazy Silicon Valley with Beamers, “I” this and that and technology galore. We chucked the TV years ago, no micro wave and no cell phones. I would like to reduce Internet time, but we find that pretty much essential to our home business. My druthers? I would rather be living in the middle of Lancaster County, helping the Amish, instead of living my fantasy in the Amish fiction I get by the droves at the library. Thanks so much for this website, Erik. Before you started sending out e mails, I figured I was pretty much alone in my life style. So good to know ya’ll! The TV would go first. Followed by my computer (shhhh….I hope it doesn’t hear me…)I would get A LOT more accomplished if I could just “cut the cord” so to speak. I don’t really care about the microwave, either. But I must say that air conditioning is non-negotiable. I’m not a big fan of non-exertion sweating. Darlene it can’t hear you, but it’s good at reading keystrokes, so watch out! I would not say that dryers are uncommon here but it is not strange to not have one if you have enough space to hang your clothes. There are some houses built in particular in the 70s where you almost have to have a dryer because there is no space to hang clothes and no basement but I think most people living in those houses still hang their clothes outside sometimes in summer. Exactly Elin, I too have seen the combo washer/dryer machine (my husband’s Aunt/Uncle have one…to us it’s a big treat having a machine after traveling around for a few weeks with a suitcase of stinky clothes :-p). I also found it interesting…at least in the UK/Ireland that washers are kept in the kitchen where in the US, your dishwasher would be. I find the washer in the kitchen in the UK interesting too. It is due to building regulations, at least in the UK, in Ireland I do not know. In Sweden most people have a ‘wash room’, a room for your washing machine and to hang your clothes in and if you have a dryer it is in there too. If you live in an apartment you have the washer and/or dryer in the bathroom most of the time but in some apartments it is in the kitchen like in the UK but that is rare. Many apartment complexes have communal wash rooms where you can use washing machines, dryers, drying cupboard/rooms, hand wash and iron your clothes. I live in one of those buildings but we have discussed installing a washing machine in our apartment if we decide to have baby. Then I would dry the clothes on the balcony or in the living room because I would have no other place to put them. Combination machines of washer/dryer are very rare in Sweden though, I have never seen one althouh I know they exist. People tend to have them as two units if they have both a washer and a dryer. I absolutely loved this post. I loved reading all the comments as well and reading what people can or can not live with out. I can not live with out my washing machine, with 5 children, washing all that laundry by hand would be very, very time consuming. With that being said we never use the dryer. Everything is hung out to dry. They sell these great drying racks at Costco or BJ’s and we have two of those to hang the clothes on. I never use the dishwasher either. While we do have tv’s in our home, there is no cable. There is regular antenna and netflix. Most of the things we do go without, I would like to say it is because we were trying to simplify..but truly it is from an economic standpoint..cutting down b/c we are a large family. Erik — You’re doing a great job with this site. It is clean, simple (which goes perfectly with the topic), easy to navigate, and loaded with useful information. Best of all you’re truly engaged with your readers. Thanks again! We have a tv, but haven’t had cable for my whole marriage (8 years) and when the US changed over to digital rather than analog, we didn’t get a converter box so I don’t even get anymore channels. Not a big deal though because all the shows I like, I can watch on the internet which is really about 5 shows. Keith, I have a lot of fun with it, which I hope is obvious! Well, a big part is I love all the back and forth. I’m always curious what folks will have to say about a post (especially, for instance, today’s oversized Amish people post…) I do appreciate what you had to say. Annmarie, thanks! With 5 kiddos, you need a laundry battle plan. I would air dry my laundry but I have limited places to hang it, and I find it leaves the clothes pretty stiff. Also, if they don’t dry fast enough, they can smell. But if you have outdoor space, definitely. The only items that might be a little stiff is our towels..but does not seem to bother any of us..lol..if your house is too humid they can smell b/c they will not dry fast enough. I think one of the reasons when I hang inside they do not smell is b/c of low humidity and (first I must confess I have a great husband who LOVES to do the laundry) he uses BLEACH..not sure how he does it but if he feels like even the darks had somewhat of an odor..he uses bleach..with out bleaching anything out..He insists bleach is the only thing that gets odors out..He has perfected the laundry process..LUCKY me..I have the hanging(if my big kids are busy) and folding and putting away job. Annmarie, hang on to that fella, sounds like a rare find 🙂 Actually, I didn’t mind handwashing so much, was a good workout. For the first 50 years of my life I never had a dishwasher, washer/dryer, or central A/C. However, after having them for the past 8 years now, I don’t think I could go without the washer and especially the A/C since hitting menopause ( sorry Erik & all the males out there, but it’s a fact and I don’t know how those poor Amish women get through this time of life in the heat & all, either )! Also, my husband and I finally caved into getting our first cell phone recently, only because my son, who lives in Colorado, kept hounding us about getting one, and also for when we travel in case there was an emergency with my elderly parents. Otherwise, we don’t have anything like an iPod or Kindle and we’re not on Twitter, Facebook, or any other newfangled thing! Eu não precisaria da tv que só passa catastrofe, acidentes e asssinatos. Gave up the TV 10 years ago. Never an air conditioner — greenery and good windows for air flow. Never a microwave, electric coffee maker, electric griddle, etc. The pattern I see — I’m using electricity where it increases the time I can spend on things I care about — not where it is a minor convenience or a substitute for skill. Electric lights double my useful hours in winter. Freezer eliminates daily cooking and lots of shopping. But dishwasher — I haven’t so many, & they get done as a break between other things or listening to my favorite radio programs. Top of my list, then — electric lights, hot-water heater, stove & freezer, vacuum cleaner, radio, washer-dryer, computer. I have given up on somethings . In summer i have to have ac or it makes some my health probs hard deal withs , I have got rid satelite tv i watch old vhs tapes an dvds once in while . Have cut the internet downs . I have lived without it an a computer befores . I have even lived without a telephone to but fnd out i cant do thts .